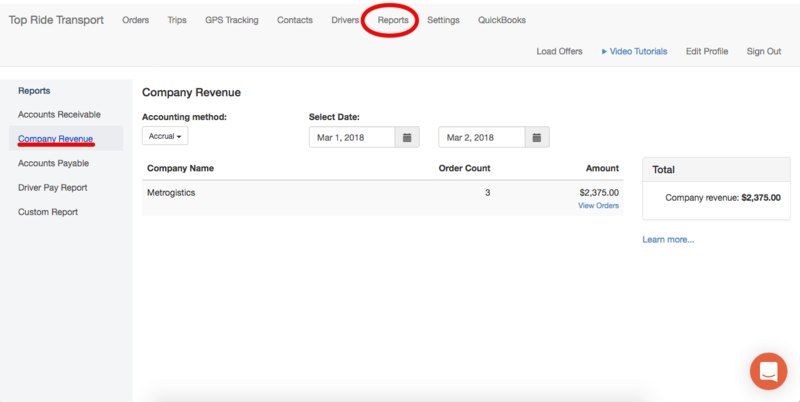 Our third new feature is a report that shows a list of the companies and the amount that they have paid you within a specified time frame so that you know how much revenue your company has made. What accounting method do I choose? We find the loads in the Paid and Archived section in the dashboard. We then use those orders' paid amount to calculate the Amount in our list. And then we filter those orders by paid date to get customers that paid within your selected time frame. We find orders from the Billed , Paid and Archived sections in the dashboard. We then find the orders' price to calculate Amount in your list. Finally, we filter orders by the invoice send date to find loads that fall within the time frame you selected at the top. Automatically we set the calendar date range to the month you are currently in. But by clicking the calendar selection button you can change the BEGINNING or ENDING date to encompass any date range after you created a Super Dispatch account. In this section you will find the comprehensive list of companies, order numbers and the total amount of revenue you have received from each company over the specified time frame. Underneath each respective total you can click the button "view orders," to see each order in detail. Total Company Revenue is the box furthest on the right of your screen labeled "Total." This is the dollar sum of all the revenue from each company listed in the middle of your screen. It is ONLY the revenue from the time frame you selected at the beginning of this process.